Happy Spring!! It has FINALLY begun to warm up here in Germany. So for our last holiday weekend we packed up and drove north to Berlin! We have been living in Germany almost two years now and this was our first visit. I know, can you believe it? We absolutely fell in love with this city and we are already planning our next trip! This city is so rich with history, culture, and should I mention the FOOD? Kevin almost had to roll me home! I have written out a rough itinerary of our adventures in the city. I hope you enjoy! Berlin is a HUGE city with so much to offer. Sometimes visiting large cities can be overwhelming. I tend to get the so-much-to-see-yet-so-little-time feeling. The first thing I do when planing a trip is pull up a map. I pinpoint the sites I want to see and I split up our days of sight seeing geographically. That way, we are utilizing our time best. With Berlin, there is a river that runs almost exactly through the middle so it is already split up quite a bit for you! I booked our stay with Airbnb in Mitte, about one block south of the Berlin Nordbahnhof. I would highly recommend this area. It was quiet yet full of shops and restaurants. The train was close so we were able to hop on and off quickly for exploring. However, I believe there has been some changes with Airbnb since our visit. I don't know if it's possible to get an Airbnb in Berlin presently. From what I read about it, Berlin ran into issues with an excess of vacation rentals resulting in making it hard for locals to afford and find apartments. There are still several hotels and hostels in this area so you are sure to find great lodging choices!! Berlin Wall Memorial: Our first morning in Berlin we had a brunch reservation that was not until 10:00 a.m. so we got an earlier start and checked out the Berlin Wall memorial. It is one of the best exhibits I have been to in Germany. It is very well done and it's awesome to walk around and explore when the weather is good. Brunch at Alpenstück: After the memorial we made a short walk over to Alpenstück for brunch. In the words of my friend Bethany, "You can't go wrong with a good European breakfast!" They had a simple menu with fabulous presentation. The interior of the restaurant was simple, fresh and light. Also, if you don't have time for a sit down breakfast they have a bakery with a pastry display. You can just get a little something to grab-and-go. New Berlin Synagogue: After brunch we checked out the New Berlin Synagogue. This building was destroyed during the war and was rebuilt in the 80's. It is now used for worship, but it is worth a stop to admire the architecture. It is a B-E-A-utiful building! Currywurst: After checking out the synagogue, we took the train up to catch our tour with Berlin Underworlds. The tour is a little long so we grabbed some famous currywurst before checking in. Berlin is famous for their currywurst and it is a must-try when you are visiting. Under the Berlin Wall Tour: Our tour of Berlin Underworlds was awesome!! They offer several different tours depending on what you are most interested in. They have World War 2 tours as well as cold war tours. We took the "Under The Berlin Wall" tour and I loved it! I loved hearing about all the escape stories from people trying to escape the west. I would for sure recommend trying to catch a tour when you are in town. Macarons at Du Bonheur: For those of you who know me, you understand I have an obsession with macarons. If I see a macaron shop, I will stop in and order "The Usual." This consists of a rose flavored macaron and a cup of green tea. It has become a bit of a tradition... and also a little personal quest to find "The Best Macaron Known To Man." We stopped at the cutest little sweet shop called Du Bonheur. The interior was bright and white and the sweet treats really hit the spot. Shopping in Mitte: Our dinner reservations were not until 9 p.m. so we spent a little time hitting a few shops. Kevin and I are what you might call stationery enthusiasts. Kevin has an obsession with fountain pens and I have an obsession with good letterpress cards. We found a few really great stores if you are interested. Our favs were Luiban Papeterie, R.S.V.P., and Polly Paper. If stationery isn't you thing there are dozens of super cute shops in this area. You are guaranteed to find a unique souvenir to take home! Dinner at Katz Orange: Our dinner reservations were at Katz Orange and it was amazing! The cocktail menu was fabulous and the decor was funky with a little bit of a southwestern twist - this Arizona native was in heaven! You really should make a reservation before hand because this place is PACKED! Tip: you absolutely have to order the "Candy on Bone." Museum Island: After a quick breakfast we took the train down to museum Island in hopes to check out the Pergamon Art Museum. However, when we got there, it was over a three hour wait just to get in the door!! We ended up not being able to get in. Sooooo.... lesson learned. Buy your tickets online or get there early before it opens if you want to get in. It is the most famous art museum in the entire country! We still had a nice time walking the grounds and enjoying the architecture just the same. Lunch at Dada Falafel: A little out of the way for our adventures for the day but we just had to stop in. 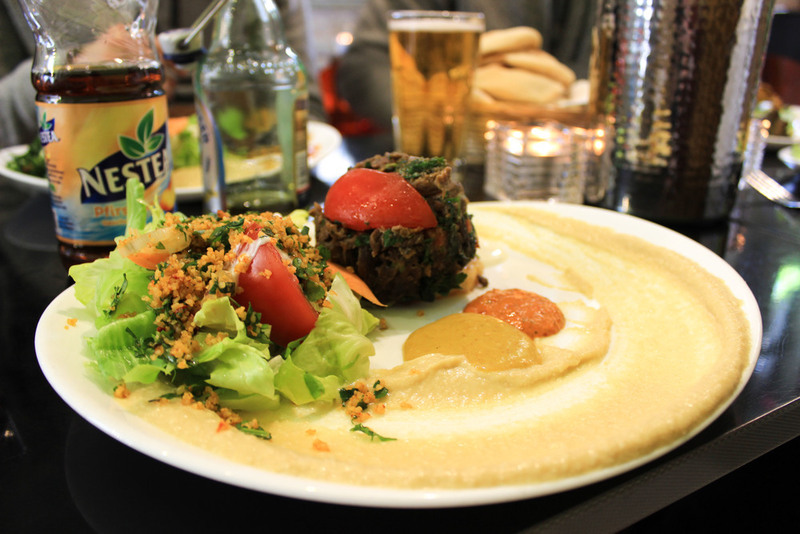 We had the best Falafel of our lives at a place called Dada Falafel. The colorful interior and modern presentation of their dishes was such a fun experience. I recommend getting the sampler to try a little bit of everything! Bebelplatz: With full bellies, we headed back over to the famous square Bebelplatz. A subtle and well designed memorial now marks the location of the famous Nazi book burning. Ritter Sport Factory: This is famous brand of chocolate here in Germany and it is so good! The best part is their wide variety of flavors. In the factory you can make your own bar if you want! Our friend Ryan made his very own bar with all his favorite toppings. So fun!! So stop in and grab a few gifts for friends back home. Brandenburg Gate: Munching on our sweet treats from Ritter Sport, we walked over to the Brandenburg Gate and Reichstag. This area is swarming with tourists, but it's one of those iconic areas of the city so it is a must see. Tip - If you want to go in to see the dome at the Reichstag you have to book online before your visit. So make sure you do this before your trip! Holocaust Memorial: Our last stop of the day was the Holocaust Memorial. This is a rather eerie memorial resembling that of a cemetery to remember the 6 million Jews who were killed during the Holocaust. Dinner at Home: Our dinner was spent back our Airbnb. Kev and I will do this occasionally to save a few Euros. Sometimes it's nice to just grab a few things from the grocery store and head home to unwind. If you are looking to eat out I have several more restaurant suggestions at the end of the post. Breakfast at Distrikt Coffee: First stop is breakfast of course! We went to Distrikt Coffee. I had their banana bread and a boiled egg. This place was bumpin' so get there early! Check Point Charlie: With full bellies we stopped by the check point charlie. This is another tourist trap, but I felt like it was important to see it- Also, I had just seen Bridge of Spies with Tom Hanks so I wanted to go see it. It was just as touristy as I had imagined with photo ops with dudes in fake uniforms but it was fun to go take a peek and snap a photo, then move on. East Side Gallery: We got in our car to head home but stopped to stroll the East Side Gallery. This is one of the highlights of the trip for me. It was so beautiful! I am a huge fan of street art and this well preserved part of the wall did not disappoint. Oberbaumbrücke: You can see this bridge from the East side gallery and it is a super cool double decker bridge. We actually drove over it before heading home! Explore Kruetzburg: This area is so rich with history! Take a tour and stay a while to explore. We downloaded an app called "Detour" and downloaded the section of Berlin. Download it and explore. We headed home after this. I know we hardly scratched the surface when it comes to everything Berlin has to offer. We plan to come back soon! There is still so much to see. I hope to visit several times more! While walking around and shopping we came across these small little golden squares. My friend Bethany shrieked!! She had read about them previously, but had never seen them in real life. Created by an artist to recognize victims of the Nazi Party, these small golden cobblestones are laid into the side walk and are inscribed with individual names. These Stolpersteins or "stumbling blocks" are scattered all throughout Europe making it the biggest memorial in the world! I will have to keep my eyes peeled to find more on our future adventures. I have a girlfriend who lived in Berlin for a while. Before visiting Berlin I asked her for a list of her favorite spots in the city. As I said, we did not even scratch the surface when it comes to hitting the highlights. We did not personally visit the following places but my friend says they are noteworthy and are worth a visit! Boxhagener Platz Market- Saturday morning market is super cute to walk around. Cafe am Neuen See- Perfect spot to check out in the summer time, you can even rent boats! Burger Meister- Some of the best burgers in town. Salt n Bone - Great meat dishes! Dudu- for good sushi and cocktails at good prices but make reservations! Have you been to Berlin? What was your favorite experience there? We recently took another little weekend trip up to Cologne, Germany. This colorful city is famous for so many things, but the show stopper for me was the giant cathedral that is located in the city center. This big beauty is Germany's most visited landmark, so naturally we had to go see for ourselves. It is so big that I couldn't fit even half of it into the frame! This girl needs a wide angle lens!! We spent a good part of the morning walking around the cathedral and what I loved most about it was how you could see how it was being cared for. I think my favorite preservation effort was in the stained glass window in the image above. This master piece is made up of thousands and thousands of tiny little glass squares made to look like computer pixels! It is a marvelously modern approach and a great contrast to the rest of the building. Next stop, we trudged through the snowy streets to the Cologne Chocolate Museum. Now, I am not a huge museum person but I absolutely loved learning about the chocolate making process. Plus, at the end they give you FREE SAMPLES from the beautiful gold chocolate fountain to the left. Cologne was the perfect weekend getaway! Although the bitter cold had this Arizona Native bundled up tight, I had a wonderful time. Cologne, you're beautiful! We took a trip to Innsbruck over Thanksgiving weekend. It was perfect because the Christmas Markets had just opened, yet it wasn't too cold for this Arizona Native. The trip was fabulous and I fell madly in love with everything this city has to offer. A highlight was taking the cable cars up to the top of the Austrian Alps and looking down at the city. This is a must see if you are ever in the area! They even have a ski lodge at the top for you to enjoy a cold beer while taking in the view. Another noteworthy site would be the Innsbruck Stadtturm. If the view doesn't take your breath away, the 148 stairs to the top definitely will! If you don't mind a little exercise this is a must see! Innsbruck was the perfect little weekend trip! We had a blast exploring the little streets of the Old Town and going to our first Christmas Market (I am forever a Nutella Crepe addict... yummm). Innsbruck, you're beautiful.